Throughout history, fluoride has been used on concentration camp victims and war prisoners alike to make them act more docile while imprisoned. Many studies have shown that fluoride kills brain cells, yet the United States government still regulates it in our city waters, and recommends it for dental health. Until enough people in the world wake up to the slow kill poisoning we have been exposed to in the United States, we have to be very careful about our exposure. Even the most cautious lightworker can be unknowingly exposed to fluoride. As much as we go for the reverse osmosis water and the fluoride-free toothpaste, every time we eat out, wash our hands in public, or take a shower in city water, we are exposing ourselves to fluoride. 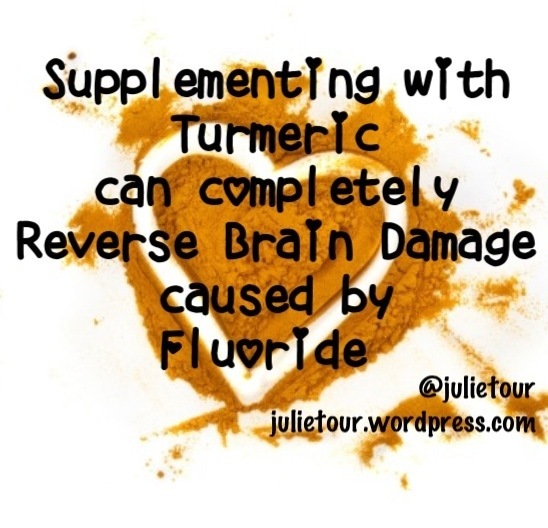 Don’t worry though– adding a regimen of turmeric intake, whether in capsule form or a daily turmeric powder to prepare in your food, can reverse the harmful effects on your brain. * Turmeric has been proven to kill cancer cells, shrink cancerous tumors, and prevent inflammation in the body. It is also now proven to protect against the neurodegenerative effects of fluoride consumption. Turmeric is an old Indian spice with a powerful medicinal compound called Curcumin. In a recent study, not only can curcumin reverse damage done to your brain cells by fluoride, but it can also prevent further damage from occurring. Nicknamed “Curecumin” for it’s healing properties, another recent study found that it is also just as effective as Prozac for treating depression. In addition to all of the benefits mentioned, it also helps joint function, aids in digestion, and can leave you with radiant skin. Before you rush to the spice isle, consider this. The potency of the Turmeric you consume will determine the benefits you receive. It is important to opt for organic, non-genetically modified brands. A natural health food store in your area should carry brands like Megafood, which source its products from whole foods, making it easy to digest and giving you a potent herb that your body will absorb 100%. Many organic brands carry both capsules and powders to swallow in pill form or cook with. The power of clear intentions bring about more precise manifestations. Every manifestation starts with a thought. Setting clear intentions with your thoughts is a powerful way to bring about your desires more quickly. From Jim Carrey, to Will Smith, to Oprah, many successful people in this current day and age have talked about how they set clear intentions about what goals they want to bring into their lives before they even begin to try to achieve it. Before I ever wrote a page, I set out the intention to write a book with my thoughts. I did this visualization process all the time in the business world and was successful at it, so I took this process to a new venture. I pictured what it would feel like to bring about a spiritually-minded book. I pictured what it would feel like to hold it in my hand, to be interviewed about it, and to have a concise, tangible book where I could share my experiences and thoughts on spirituality, law of attraction, and the afterlife. The manifestation process is following up on your inner guidance from your intentions for your desired manifestation. It seemed like a little amount of effort added up to huge transformations over time as the universe clearly responded to the intentions I set. I was connected with thought leaders in the field of publishing and spiritual teaching to affirm I was on the right path. Less than a year later, I have most of my book written. 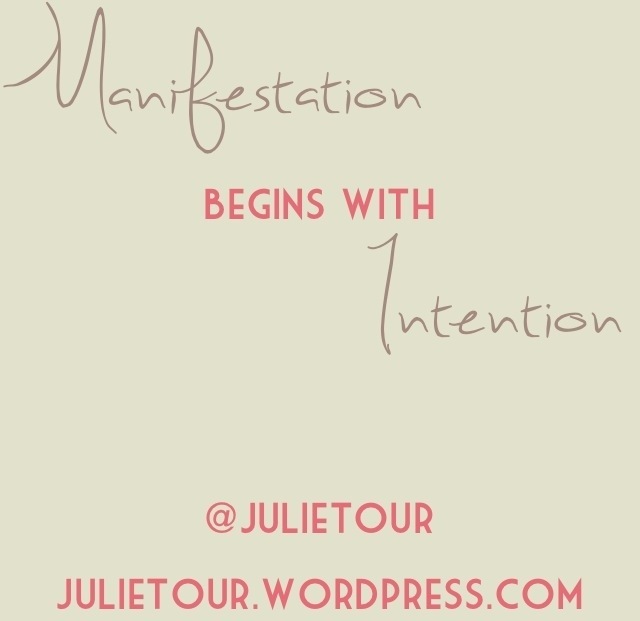 My intention has been manifesting into form, and it has been the most rewarding process. This process can used to manifest in many areas of life. Be a scientist and try it for yourself. Next time you wake up in the morning, set clear intentions for the day you would like to manifest ahead. Visualize how it will feel at the end of the day to have had the experiences you desire for yourself. Whether you set the intention to connect with helpful people, to flow through your schedule with ease, or to manifest abundance with your sales, your intention in the morning is your way to co-create the day ahead with the universe. Follow your guidance and go with the flow, and watch your manifestations unfold. Numerology is the study of number meanings. One area of study is to recognize angel numbers. Those who have experienced angel numbers recognize that repeating numbers are divine messages from our angels. Angels communicate with us in a variety of ways, including signs from nature, coins appearing without knowing the source, feathers appearing, giving us recurring divinely-inspired ideas, our dreams at night, angel cards and, of course, angel numbers. Our divine messages through seeing repeating numbers get ever increasingly more interesting when they appear to us at synchronistic moments. 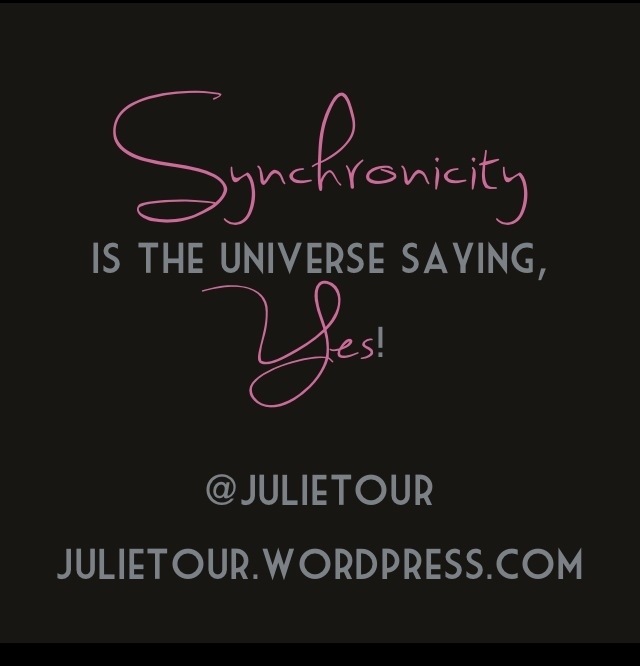 Synchronicity is a meaningful coincidence. When you see an angel number moments after you asked the angels for help, or during a specific situation that worked itself out miraculously, the meaning behind angel numbers is enhanced by it’s synchronistic moment. I will give an example that happened to me recently. Last night, I had a difficult time falling asleep due to a terrible stomachache. When that happens, I love listening to angel-themed guided meditations. Specifically, I started listening to an angel therapy playlist on my iPhone by Doreen Virtue at about 12:30 am. During the meditation, I mentally asked Archangel Raphael, the healing angel, to heal my pains so that I may drift asleep. I must’ve drifted to sleep moments later. My playlist must have been on repeat because I awoke in the middle of the night to Doreen restating the part about healing with Archangel Raphael. It seemed like I only drifted off moments before but time must have passed because I had already heard this part. I reached for my iPhone to slide it open. 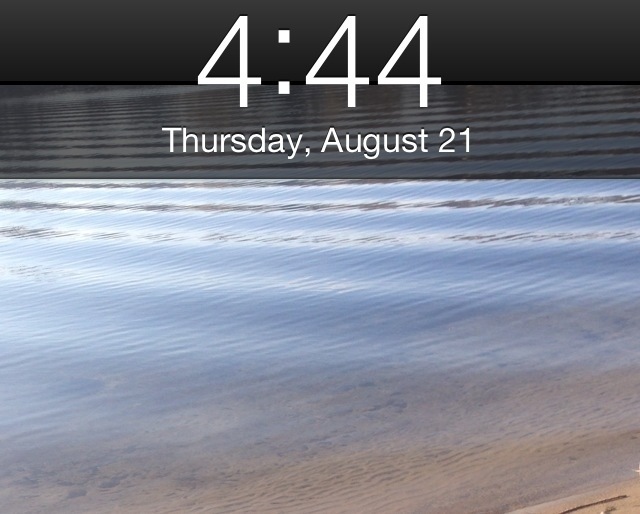 As Doreen mentioned Archangel Raphael’s name, I saw it was 4:44 am. 444 means that angels and archangels are everywhere around you, making their presence known. I then realized at that moment that my stomach pains had ceased. I was healed and had been sleeping for hours. In that synchronistic moment, I realized Archangel Raphael had heard my prayers and wanted to let me know of his healing presence. This is only one example of many. 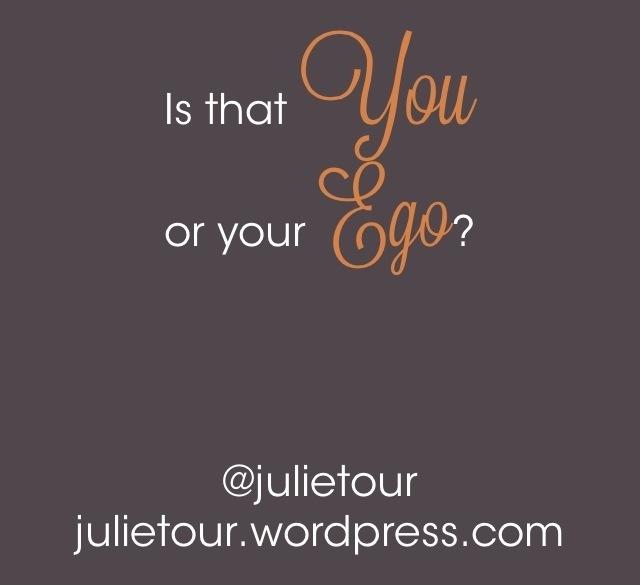 I write a lot about my first experiences in my upcoming book and how I first invited divine messages into my life. 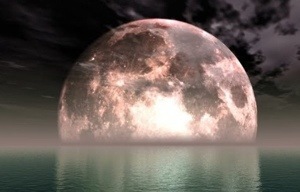 Synchronicity and numerology work hand in hand to give us tangible messages from heaven. Understanding and noticing how numerology and synchronicity work together will increase the number of experiences you have. When these experiences happen to you, the presence of the divine is always with you without any doubt. Inviting synchronicity into your life is to notice the meaningful coincidences you experience. Synchronistic moments are answers to our prayers. Need a new job? Coincidentally, you met someone who knows the perfect person who could help you right at the right moment. Need a new car? No problem. You walk down the road and see a for sale by owner sign on a car for the perfect price. I have literally experienced these things. All I had to do is ask God and the angels, and trust that these things would happen. I asked for a clear sign and divine assistance, then I was open to whatever presented itself. If you outline how your prayers should be answered, you may miss the boat. Be open to new things and trust that these coincidences are something the universe knows will be perfect for you, even if its not exactly what you expected.